So 2016 started with the devastating news that the world had lost one it’s most inspirational and talented artists of all time. The sad news of David Bowie’s death on the 10th of January was a heartfelt shock to so many of us. A true musical genius, fashion icon and legend of his time. With his innovative music pushing boundaries and ever changing style, David Bowie was truly out of this world. A south London boy with an intergalactic soul, Bowie`s influence shaped the music scene spanning generations and touched the lives of millions. So what better way to Honor such a modern day hero than with his very own place in the cosmos! 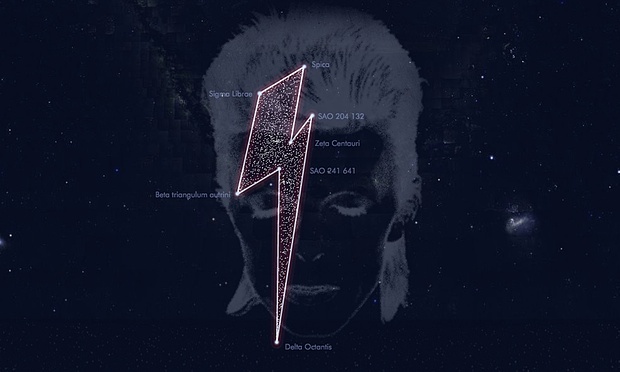 Belgian astronomers have given Bowie his own constellation, consisting of seven stars that shine in the shape of the lightning bolt which appropriately sits in the vicinity of Mars!